Geraldine, a native of Dublin, came from a happy home where hard work and education were highly valued. She was not a fan of school but worked hard so she could get out into the real world as fast as possible. She loves adventure and travel and was a keen canoeist and sea swimmer. She is still a regular at the Forty Foot today. Geraldine has an Advanced Diploma in Marketing Techniques from The College of Marketing & Design, a BSc(Mgt), and an MSc(Mgt) from Trinity, a Certificate in Nutritional Coaching from the IINH and a Postgraduate Certificate in Creative Thinking, Innovation & Entrepreneurship from Trinity. As a graduate in the early 1990’s when the economy was in deep recession Geraldine was lucky enough to find work in Ireland. She was one of 3 graduates of business disciplines to be accepted on to an Irish Trade Board programme designed to part-fund and place graduates in medium sized companies in an effort to grow the Irish economy. 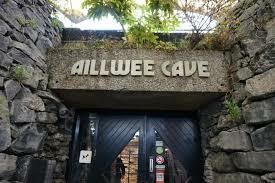 Geraldine’s first role was in Tourism Marketing at the Aillwee Cave Ballyvaughan. Here she found a life-long mentor in her first boss Roger Johnson, an entrepreneur and visionary. Roger, an Englishman who had worked in South Africa as a diamond miner, thought it would be a good idea to open a show cave in the Burren and despite all the odds, he achieved his goal. “Roger actively encouraged me to be creative and supported my many ideas. He instilled in me a sense of confidence and a belief in my abilities to get people onboard”. Beautiful as Co. Clare was, it was a bit too remote for Geraldine. She moved back to Dublin where she moved through Sales and Marketing roles before securing a Brand Management role in Glanbia (Avonmore Foods). Geraldine moved through the ranks and her ability did not go unnoticed. She left Dublin to take up the role of Sales and Marketing Manager for Glanbia’s Dairy Ingredients Business in the USA. In 2000 she became Sales & Marketing Director with Ingredientsnet.com (a JV with Glanbia and Fyffes) an E-commerce portal for worldwide procurement of food ingredients. Unfortunately the funding for the fledgling business ran out and she returned to Ireland. Her E-commerce business experience however was very valuable and allowed her the opportunity to become the Business Development Manager for Superquinn.ie, Superqinn’s online business. Working closely with Fergal Quinn she was tasked with building a successful online customer experience. She devised and opened the first drive through ‘Click & Collect’ grocery shop in Ireland, which won a Global Marketing award for Innovation awarded by Accenture USA. Around this time Geraldine had 3 children in quick succession and was more or less forced to leave the corporate world. “The crèche fees for 3 babies meant it made no sense to continue working in the corporate environment. I was just earning money to pay for their childcare”. She and her partner decided to purchase a distributorship for Ireland for a range of Market Leading Sports nutrition products. The sports nutrition sector was beginning to really take off in Ireland and they felt that investing in this sector would secure a future for their family. 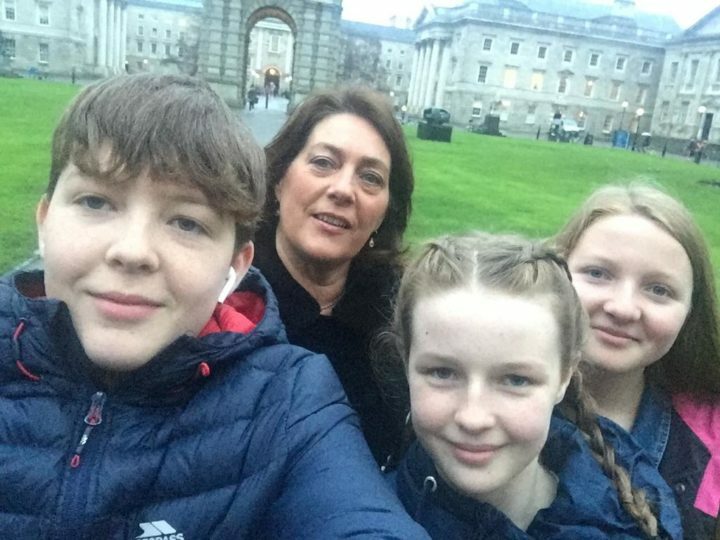 Starting a business with 3 small children was not ideal timing but it gave Geraldine the opportunity to continue working in an exciting growth sector, and importantly she was able to do it from home. During this time she also set up an online supermarket for special dietary (gluten free, wheat free, dairy free, etc.) ambient food products. Unfortunately the multiples soon recognised the value in the specialty food sector and started to stock large ranges in store. Geraldine found it hard to compete on price and decided to close the business. Following the breakdown of Geraldine’s relationship she felt it was no longer possible to work in the family business. “Unemployed and with three children under 10 there was no other option but to return to work. I have 3 children in 3 different schools with 3 different activity schedules. Add to that school concerts, matches, sick days and sports days and it becomes very clear that work flexibility is vital. An obstacle facing Geraldine was that she was being perceived as a ‘Returner’. Returners are a new cohort in the corporate world. Some companies she encountered had programmes to assist people (often women) who have been out of the workforce for some time due to family responsibilities to return to work. “The company gets a reliable, experienced person but pays them an interns salary on the premise that they are helping them get back to work. Financially it was not a viable option for me. Part-time roles all came with fixed part-time hours. I found it frustrating that my skills and abilities were not valued just because I required flexibility. I felt like I was going to be held to ransom”. A company Geraldine had come across offered her a Professional Contracting position. She did not know how to get set up as a Professional Contractor to avail of the opportunity. “I was unaware of managed accountancy solutions like Umbrella companies. Within a few hours of contacting Contracting PLUS ‘I’ was a new business. I can’t believe how simple the whole process has been. Contracting PLUS do all my invoices and look after all my tax affairs”. “They have a tax portal with a checklist which I just completed and then they did the rest. I love their smartphone App – I upload my expenses as and when they occur, which works great for me as I was always losing receipts back in the day. Their software allows me to do any small bits of admin at times that suit me (like when the kids are in bed). It really couldn’t be easier”. All the flexibility you need while getting paid a fair rate. Exciting, varied work that you may not normally get the chance to do. It forces you to up-skill. Work with a wide range of colleagues without the usual office politics. Contracting rewards the entrepreneurial spirit and innovative mindset. Contracting allows you to move your working hours around. You never feel beholden to anyone and you rarely miss an event in your child’s calendar. 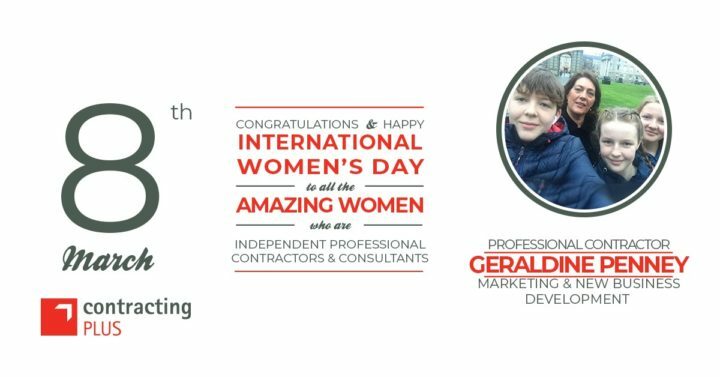 Geraldine says I would encourage anyone with qualifications, experience and a strong work ethic to look at contracting as a way to achieve a better work/life balance, a more rewarding career and an opportunity to take home more money at the end of a month than you do as an employee”. If you have a strong skill set and are able to work independently, contracting could be a great move for you. It is definitely a way of maintaining or re-establishing your value if you are returning to work. Find a mentor so you have someone you trust to bounce ideas off in case you lose the run of yourself! Build up a network of contacts that have skills you don’t have, you never know when you can do each other a favour. Network and up-skill. As a contractor courses related to your field of work are expensible items so you learn cheaply. Finally she says “If you can, at least try it, you will have nothing to lose and the outcome might surprise you”. Geraldine says my favourite career moment is ‘Bear Day’. ‘Bear Day’ was a fundraising initiative in support of the Romanian Orphan appeal. Bear Day culminated in a family fun day at the Aillwee Cave, a Balloon Race, (5,000 balloons were released from the cave and the owner of the balloon that went the furthest won €100, the winning balloon was found in Germany), 1,000 Teddy Bears which had been sponsored nationally by school children and Companies at €20 each were displayed in the Cave entrance building. These Bears were later shipped to orphans in Romania. We raised circa €30,000 which was used for the refurbishment of the orphanages. The whole community got involved and we all got to do something worthwhile.